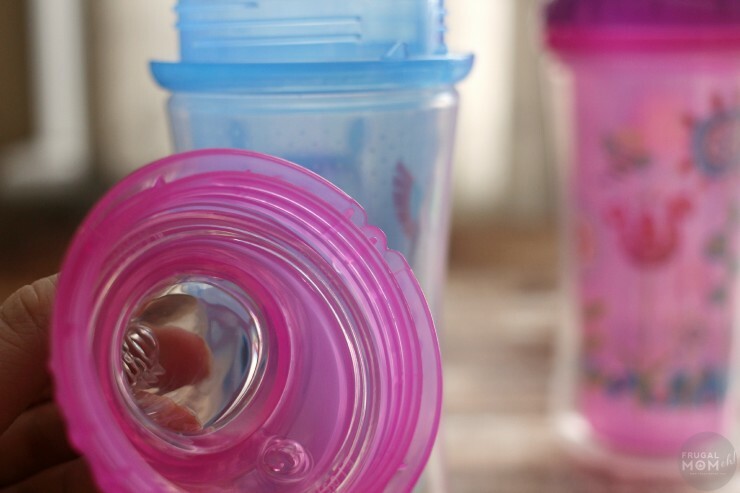 Nûby Clik-it Infant and Toddler Cups - Frugal Mom Eh! Ava has been drinking from regular cups at the dinner table since she was about 10 months old. She is surprisingly good at it. Beyond the kitchen table though, we do have to put our trust in infant and toddler cups. No matter how good your little one is at not spilling when they are sitting and focusing on eating and drinking, they just aren’t going to put the same attention into it while playing. This wouldn’t be a problem if both girls didn’t make it their mission to make every single sippy cup they get their tiny hands on to leak. They are good at it too. I’ll fill a cup with water and give it to Ava and within 5 minutes she will have created a puddle either on the ground from dropping the sippy cup or a puddle on her tray from messing around with the spout. I was sent some cups from Nûby Clik-it to check out with my two little monkeys and I was curious to see they would put an end to the never-ending puddles around my house. “Nuby’s new Clik-it™ range of cups offers leak proof technology that you can see and hear so moms and dads won’t have to worry about spills and leaks!” Let’s find out if this promise holds true! The No-Spill Flip-it cup from Nûby features a soft silicone straw which is covered by an easy-to-use flip top cap. This is a super handy feature as it helps to protect the straw from getting dirty when its not being used. 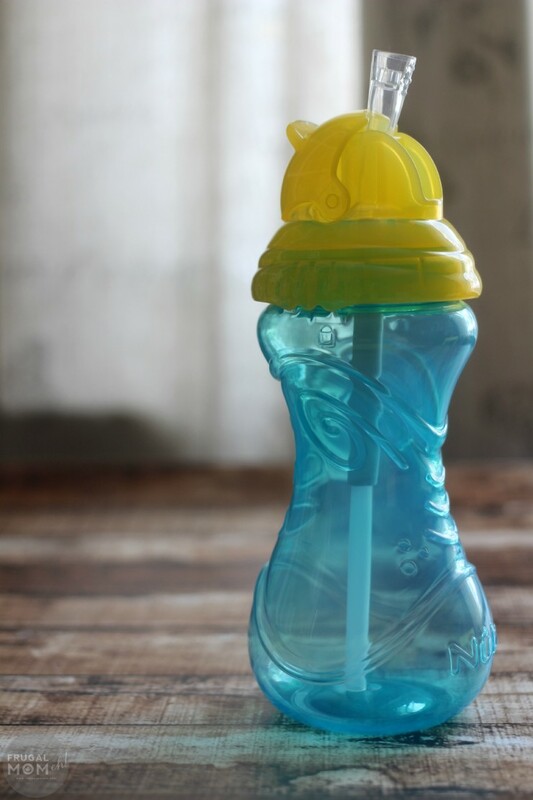 Just fill the cup, twist the cap until you hear a click and throw it in your purse or diaper bag while on the go. The cap keeps the straw clean and the clik-it technology keeps your bag dry and mess free. So far the girls have been unable to create puddles with this one as their drinks only pass through the straw when they are actually sipping on it. We love how easy the Sport Sipper is for both girls to grip thanks to the ergonomic shape and the grips designed on the bottle that ensures a comfortable, secure grasp no matter what they are doing. The No-Spill™ GripN’Sip™ is uniquely engineered with Easy Grip™ handles that make this cup easy to grip and use for baby. This cup was obviously made with the transition from bottle to sippy cup in mind and easy to drink from thanks to Nûby’s valveless, leak resistant design. The cup is small enough that a small infant can easily handle it themselves but still big enough that a beginner won’t immediately need it refilled. Nûby’s new Insulated Clik-it™ cup offers the same leak proof technology of the other cups but it also helps to keep liquids cool and for those with pretty new furniture, it also helps protect furniture from a “sweating” cup. We love these cups for the playroom as the girls tend to drink a little, put the cup down and go back to playing so it sometimes goes hours before being replaced. (Try telling a 14 month old you ware just getting them a fresh drink!) I can see these cups as being lifesavers in the summer months with trips to the park, the beach and picnics. These cups also feature Nûby’s valveless, leak resistant design. What I really appreciate about these cups are the built-in valves. They are so easy to clean! I can’t begin to tell you how many cups I’d had to trash because of stuff growing in and around the valve. We all know you sometimes find a cup that was deviously hidden several days before and the cups with multiple pieces in the lids just don’t stand a chance against those conditions so I always look for cups with built-in valves these days. I also like that the clik-it technology does not involve trying to line things up. Simply twist on and wait for the click and you are set to go! 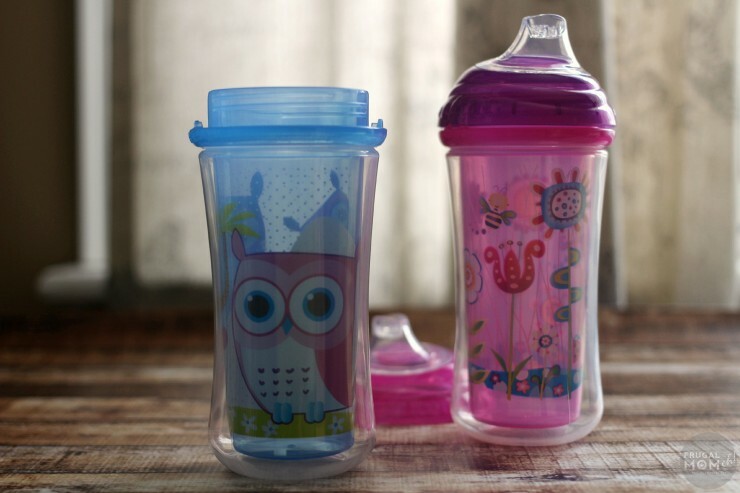 The MSRP is $4.99 for the Easy Grip Cup and $5.99 for the other models and they are all available to purchase at Babies“R”us . We don’t own any of these yet, but I love the look! I will have to get some of these, they are too fun! 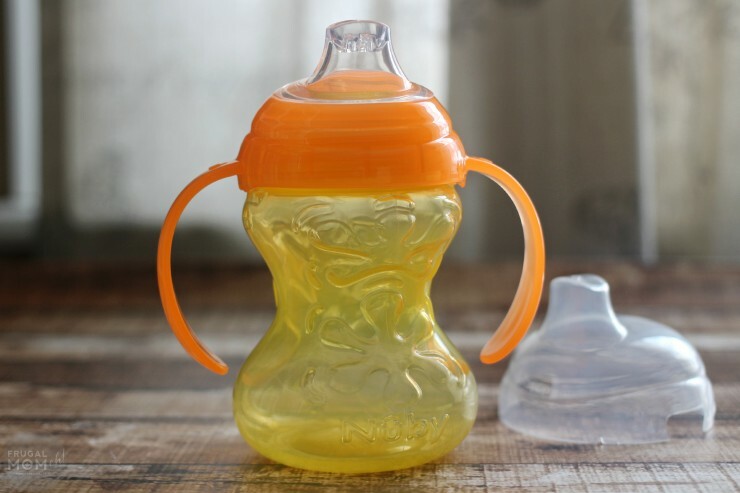 These are the same sippy cups we use and we love them! My son thinks they are fun and I love that spills are limited. All of these are awesome! I especially love the no spill flip it cup. Perfect for my kids. These are so great! I’m a big fan of durable AND cute when it comes to anything for the little ones. I need a few of these! Those sound like some awesome products. I don;t think this brand was around when my kids were babies. I love the Nuby brand! These sound great, its crazy how fast the kids can make sippy cups leak! These are really cute! Kids would have no trouble hanging on to them! I love these!!!! The owl is so cute- I think I am going to get one for MIllie! Built in valves! Love that idea. I always hated when you would lose one and the whole cup was trash. These look like perfect cups for my friend. She has two little girls that love to make a mess with there drinks. 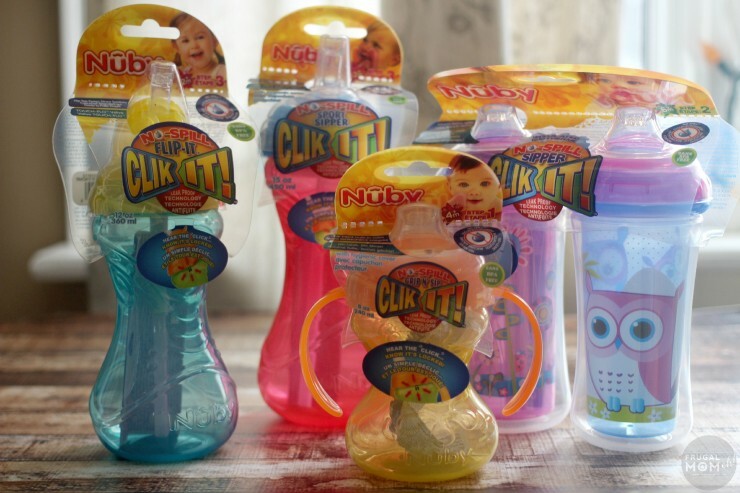 The Nûby Clik-it looks like a great line of kids cups. 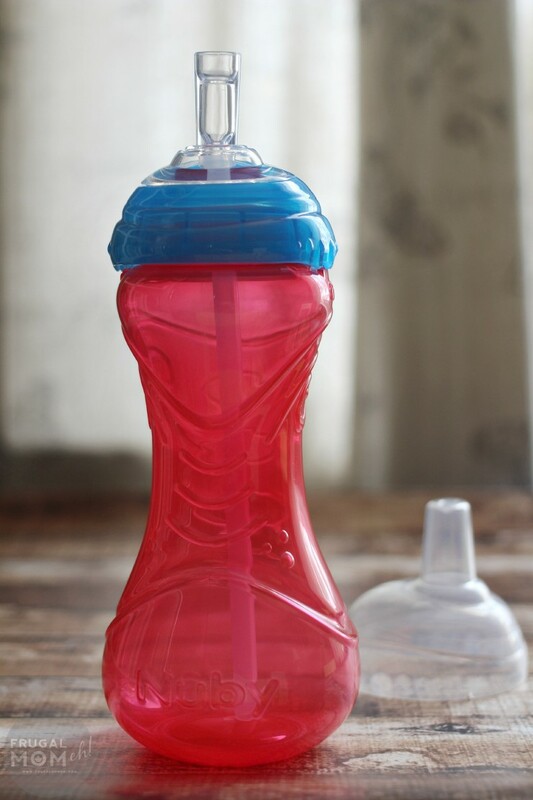 The Flip it no spill would be perfect for my friends little ones. My kids used to use these when they were little! They are great!!! I like the fun, bright colors and patterns of these as well as the fact that there are insulated ones to.keep drinks cold. Really great products! But I am thankful my kids no longer need those! These look so easy to use for little hands!